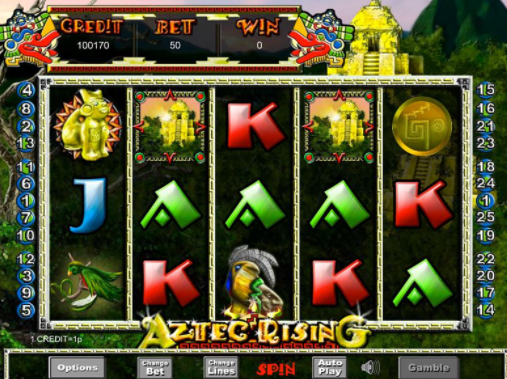 Climb the steps of the Mexican pyramids and sacrifice everything you have to offer in this Aztec themed 5 reel uk slots online game. Unlock the ancient calendar stone and inherit some magical free spins, generous cash rewards and the respect of the Aztec race in this online slot game. Developer Eyecon has been running as a successful computer game company for over 20 years. Two years after it was founded their online casino took off and their first slot game was introduced in 2003. They are one of industry’s leading online slot game developers for bingo and casino based websites. Eyecon have produced over 60 high quality popular and timeless games available to players across many online gaming platforms. Each game is created to provide every player with a game they can enjoy for a long time and each year more players and playing unique games with Eyecon. Click here for more Eyecon slot games. Travel back in time to Mexico in this amazing Aztec themed slot game and win some colossal prizes. It is a 5-reel 25 payline sot game featuring a bonus round, extra spins and a gamble feature. The symbols are divided into higher and lower value, the lower value being King, Jack, Queen and Ace and the higher value cards are a leopard, a bird, an Aztec feathered head and Golden statue. To begin your hunt for treasure across Mexico you must first select how many credit you wish to play starting from 1 up to 15 credits per line. You can choose between 1 and 25 of how many lines you wish to play for. The ancient golden temple is the wild symbol in this game which can be found in the middle of the jungle. The wild will substitute all other symbols in the game when it appears on reels 2 and 3 however this does not count for the scatter symbols which are the calendar and the coin. The prizes awarded for a wild symbols helping out a winning line are doubled. If you're interested, more casino bonuses are shown here. The coin symbol will take you to the free game if 3, 4 or 5 symbols are lined up and will receive 15, 20 or 25 free spins. In the free game when a winning symbol is formed your prizes will be tripled. More coin scatter symbols appear in the free game you will be awarded pays of 2, 5, 20 and 100 credits for 2, 3, 4 or 5 such symbols. The scatter symbol which is the calendar is an extraordinary symbol featuring a colourful ancient drawing of a man. The doors will open to Prize Pick feature if you get 3 or more calendars on the reels. In the Prize Pick feature you will find 5 selection tables around the Aztec Sun Calendar which awards you with one pick for each Calendar symbol in the triggering combination, the prizes awarded comes up to 100 times the triggering bet. Learn how to deposit by mobile and claim your free spins today! 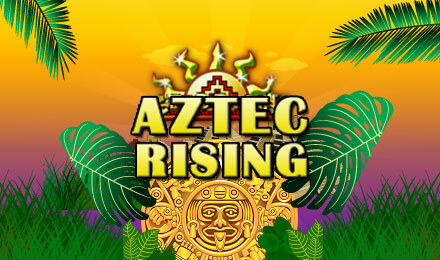 Aztec Rising captures the historical culture perfect in this slot based game with the animation and symbols used the game puts you in the heart of Mexico as you start a quest to find the treasure. This unique and fun game from Eyecon is sure to keep you entertained so give it a try and win some spectacular prizes.